Dr. Stanley Applegate was born June 23,1920 in Ft. Smith Arkansas. Later the family moved to Rogers, Arkansas. Stanley grew up helping his father and paternal grandfather, both pharmacists, in their drugstore and often delivered medicine to local physicians. He took the opportunity to watch the local doctors, which led him toward his decision to go to medical school. After graduating from the University of Arkansas, he enrolled in The University of Arkansas Medical School, graduating in 1945. The government sponsored medical education under the V-12 program during WWII and Applegate as a student of that era served out his obligation in Korea. He became Chief of Orthopedics and then was ship’s surgeon on the return to San Francisco. He was hospitalized for hepatitis for 6 weeks after his return in the Army-Navy Hospital. Dr. Applegate was active in the Arkansas Medical Society. During his tenure as president, in 1972 he traveled 100,000 miles to speak to every medical society in Arkansas and urged doctors to get into politics to keep government from taking the practice of medicine from them. He helped raise money for the Washington County Hospital and later urged the Fayetteville doctors to cooperate and build a hospital to serve both cities. Because the 2 groups couldn’t agree, Springdale built its own hospital in 1952 with Hill-Burton funds. His many other civic interests and services included: President of the Washington County Medical society and member of the 9th Counselor District of the Medical Society for many years; Chief of Staff, Springdale Memorial Hospital; member of Arkansas Medical Board for many years; Chairman of the Industrial Committee of the Springdale Chamber of Commerce to secure industry; active membership in the Presbyterian Church and as member of the Board of Director of the University of the Ozarks in Clarksville, a Presbyterian college; service on 2 medical missions; co-founder of Springdale Savings and Loan. A paper by Joe B. Hall, M.D. stated, “Dr. 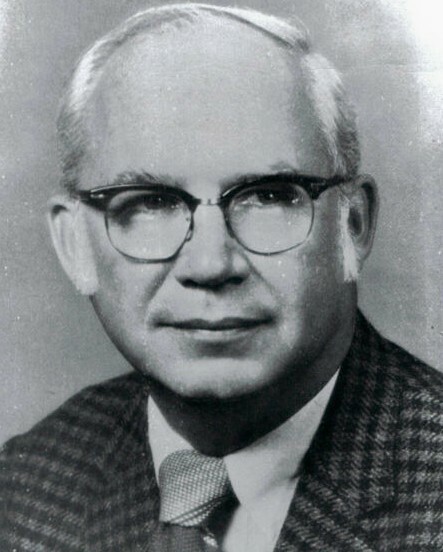 Applegate has served his community, country, profession and his fellow man during the transition of medicine from primarily an art to primarily a science. His life and his work will shine through history as an example of both the art and the science of medicine. Dr. Applegate was married 3 times. He had three children by his first wife. Both she and his second wife died. In late life he married again. He retired in 2002 after 53 years of practice. On Oct 3, 2006 he died at the age of 86 and is buried at Bluff Cemetery. Ref: J.B. Hall, M.D., unpublished paper, circa 1995. E.M. Singleton. 15 March 1999.